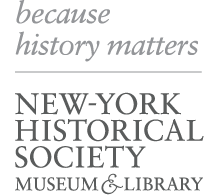 The Art of History is an innovative program that teaches New York and American history, art history, and the visual arts using tangible historical evidence from the vast collections of New York’s oldest museum. Students will hone their observation and descriptive skills as they create art projects to visually document their history learning. Learn how cartographers use visual symbols to convey important information about a place and how historians use maps to understand the past. Art Activity: Printed maps that depict students’ boroughs or neighborhoods. Examine artifacts and images to learn about families in the part, including their clothing and jobs. Art Activity: Then-and-now family portraits using watercolor pencil. Explore works of art from the 18th, 19th, and 20th centuries that demonstrate how and why transportation in New York has changed. Art Activity: Mixed-media collage using shapes and forms to depict vehicles from long ago. Consider the Hudson River’s place as New York City’s most important waterway since the 19th century, and through social and environmental history, learn about challenges facing the Hudson River today and in the future.